One of our vendors lives and works out of an ocean-view condo in Laguna Beach, California, where taking long walks throughout that quaint Southern California “Art Colony” is an added bonus for many of its residents. A far cry from our wooded headquarters of Wilmington, North Carolina, our vendor’s office is set squarely between reality and the Pacific Ocean. During one such salt-air stroll, he came across an affable homeless man who sets up shop most days in front of Laguna’s historic movie theatre. Sporting a neatly trimmed grey beard and a big smile, the open-air entrepreneur sells colorful, custom-designed patches for application to denim jackets and trousers. 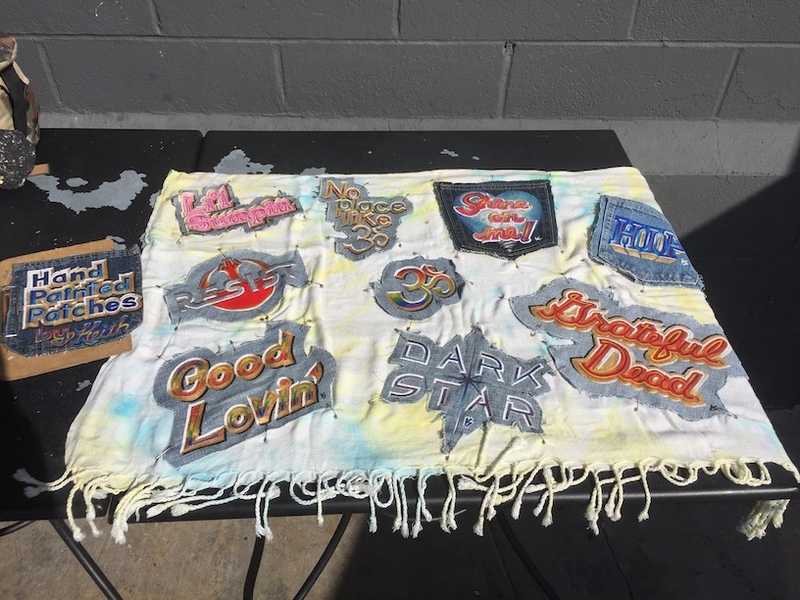 As you can see from the image below, these unique patches are, as their creator says, “perfect for Deadheads.” And anyone else with a taste for whimsy. The pair struck up a conversation and our vendor found Keith Sanderson to be a friendly, upbeat man who enjoys selling his patches and chatting up the locals — whom fondly refer to each other as “Lagunatics” — in that free-spirit community. He also caters to the hordes of tourists who frequent the town’s nearby boardwalk on any given day. During one such friendly exchange, our vendor noticed a new sign next to Keith’s patches that read, “Will work for a new backpack.” Spotting his frayed and forlorn North Face backpack lying on the ground nearby, our vendor made a call to our North Carolina headquarters and asked if we might be interested in digging up a used pack from our gear shed and donating it to Keith. 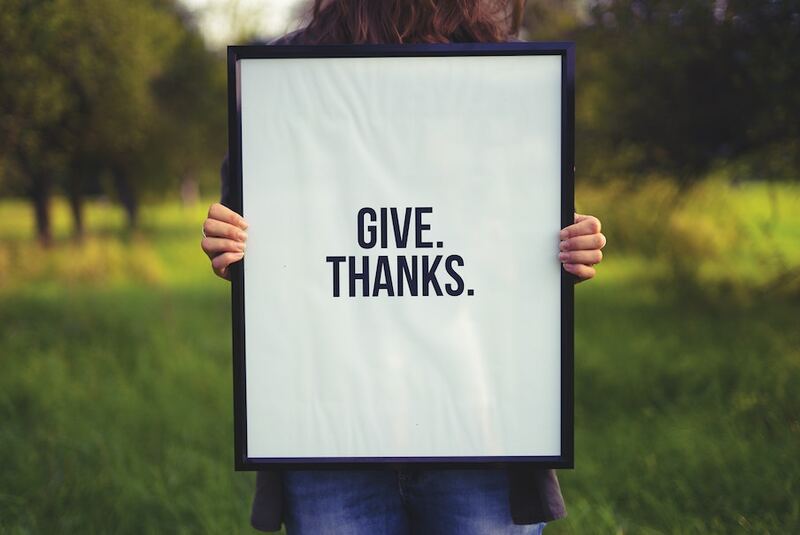 Gratitude is most often used as a noun, describing as it does, the feeling of being thankful. This warm and comforting word is often bandied about during the holidays, when we reflect upon all of the things for which we are grateful. But for some of us — and in particular, many of our staff members here at The National Center for Outdoor & Adventure Education (NCOAE) — we treat the word gratitude as a verb. Great employees often live in gratitude by taking positive action. And that means being present for others, which includes listening to their issues or desires and connecting with them. It also means becoming the person that someone else is grateful for. Just before the holidays truly got underway, we asked some of our staff members to list just some of the things for which they were most grateful. We’re not the least bit surprised that some of their comments encompassed our students and fellow staffers. Today, we can happily report that — following the trials and tribulations of last month’s bullseye hurricane confrontation on our Wilmington, N.C. campus — we here at The National Center for Outdoor & Adventure Education (NCOAE) are back in action. In fact, just a week after our return from evacuating, everything was cleaned up and looking like Hurricane Florence had never visited our 17-acre outdoor education campus. But no matter how experienced you might be at preparing for, evacuating from, and recovering after a natural disaster, you can never fully anticipate what Mother Nature might toss your way as part of her standard repertoire of weather. And while today, with on-campus and field courses back in action, it certainly didn’t look that way on the morning of Friday, Sept. 28, when a thunderstorm completely unrelated to Hurricane Florence rumbled over our property. That’s when a massive bolt of lightning hit the window of our director of operations’ office, sending a bolt of energy through her keyboard to her fingertips while she was working. A second bolt of lightning hit a tree adjacent to our gear shed, traveled down the tree, through its roots, blowing a hole through our property’s water line and sewer line, and cooking the conduit that houses our property’s power line. Those of us who work here at The National Center for Outdoor & Adventure Education (NCOAE) are taking some time off for the holidays this week and next, and we’re also taking this last-chance of-the-year opportunity to seek donations, gifts and volunteer time from our partners and friends. First, we want to tell you about our holiday schedule, which will see us closed this Thursday through Sunday (Dec. 24-Dec. 27), reopening to normal hours (8 a.m. to 5 p.m.) on Monday, Dec. 28, through Wednesday, Dec. 30, and then a half-day schedule ( 8 a.m. to noon) on Thursday, Dec. 31. We will be closed on New Year’s Day and open up shop again on Monday, Jan. 4. Next — and we are always enthusiastic about end-of-the-year donations — here are some actions you can take to help underserved youth this holiday season. In addition to that warm feeling you get from helping a very good cause, you should remember that NCOAE is a 501(c)3 nonprofit organization, and all donations are tax-deductible to the fullest extent allowable by law. We here at the National Center for Outdoor and Adventure Education are closing up shop today — Wednesday — and again on Thanksgiving Day and Friday, but we’ll be open from at least 11 a.m. to 2 p.m. on Saturday and Sunday. Then it’s back to regular office hours on Monday — just in time to celebrate the first day of December. Like many outdoor education organizations are, we’re thankful for so much this year, including all of the wonderful students who have taken our courses, the great instructors we get to work with, and of course our amazing vendors and funders. Most of all, we’re grateful for the dozens of absolutely beautiful places where we’ve guided and taught in the outdoors — all designated as Wilderness and all offering memories of great adventures. The novelist, essayist, playwright, poet, and social critic James Baldwin said it best when he wrote: “We are responsible for the world in which we find ourselves, if only because we are the only sentient force which can change it.” Those words guide us here at The National Center for Outdoor & Adventure Education (NCOAE). Sure, we’re all about extreme adventures for teens and adults, along medical training for those interested in working in outdoor education and backcountry guiding, but at our core is a deep desire to help make the world a better place. Through our values-based outdoor and adventure education curriculum, we’re able to foster an environment where personal growth and development flourish. But like most outdoor education programs fronted by amazing administrative staffers and outdoor educators and guides, we’re unable to do it entirely alone. That’s why — in addition to charging registration fees for our courses and trainings — we actively submit grant applications to foundations, seek gifts-in-kind, accept donations online, and encourage volunteers to share their time and expertise with our growing not-for-profit organization. Sadly, most outdoor education programs would shutter if they had to survive on registration fees alone. It is only when registration revenue is combined with non-registration revenue (e.g., product sales) — and then augmented with grants and donations — that we find ourselves on solid financial footing.